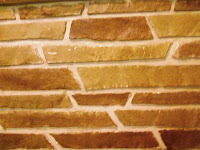 The most effective way to use the faux brick technique is in a small section in the corner of a room, or around a window frame. It should look as if plaster has come off the walls, leaving the faux brick exposed underneath. You can of course choose to cover more of a wall than this, but don't be too ambitious in the size of area; a small section of wall works best. Draw a rough outline in pencil onto the wall where you want the faux brick to be. Paint over this area with a warm paint wash: dilute equal parts water to a brown, red, and orange mixed paint. Swirl the paint onto the walls to create a warm color, and start building up texture. Cut a regular sponge to the dimensions of the side of a brick (approx 8.5"x 2.5"/215mmx65mm) to create your stamp. Think about what kind of brick color you want to achieve. A dollhouse perfect red clay or a more rustic brick with lots of added texture, are popular choices. For the red clay effect, mix together red, brown, and a touch of yellow ochre. 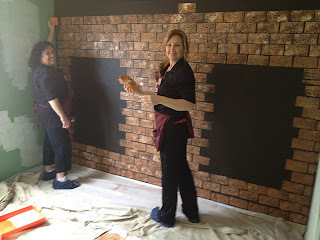 Using a picture as a guide, add extra colors as you need them to create the realistic looking faux brick paint color. For a more sand colored faux brick wall, start with a mix of burnt sienna and yellow ochre with a bit of brown, and add extra colors if needed. Adding brown to darken, or cream to lighten, will give a more natural effect than using straight black or white. When you've perfected the color, pour it into a tray and dip your sponge stamp into it. Dab off the excess paint onto a paper towel until there is only a slight covering of paint on the sponge. Press the sponge onto the wall within your pencil guideline (use masking tape if you need to). 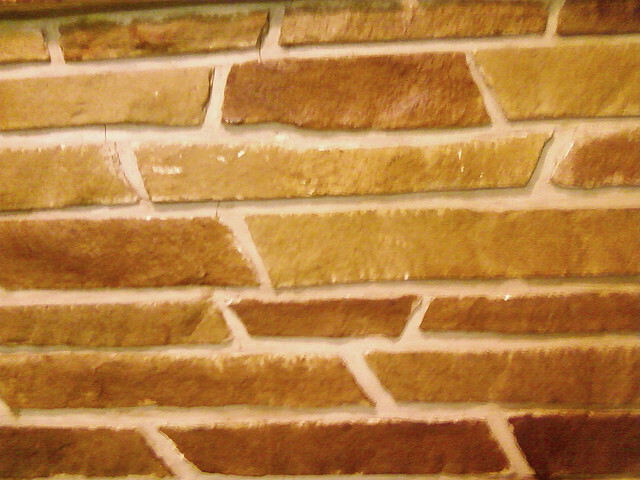 If the faux brick impression is too faint, then go over it again to build up a realistic looking textured brick. Finish this process when you are happy with the result. Leave space around each brick, to add the mortar detail later, as you move onto sponge paint the next faux brick. Mix up a combination of Payne’s grey and burnt sienna (grey and beige - adding white if necessary), and begin adding mortar detail between your sponged on faux bricks, with a small paintbrush. If you are not confident at doing this, then start with a watered down version of your color, and build it up in small strokes. It is fine to "go over the lines," as even the most uniform of bricks have inconsistencies. This process all adds to the visual interest and texture. If you go badly wrong, then try sponging over the faux brick in that section again, even using a darker color, or adding some black. Faux brick wall completed, there are several ways in which you can add texture to make your faux bricks look even more realistic. When the paint has dried, use a small piece of medium sandpaper to rub gently over the painted faux bricks. If you don't rub too hard, it really helps to exaggerate the texture, and starts bringing the faux brick wall to life. Splattering is especially effective when used on the more rustic type of faux brick. Using any combination of paint colors, with the main color being brown or beige, is effective, and then water it down. Dip an old toothbrush in the paint wash, and run your finger over the bristles, close to your faux brick wall, to create a "splattered" effect. You can even add faux cracks, to the outside of your bricks where the "plaster" has come off the walls. Using these techniques will have shown you how to paint using sponge on faux brick walls, to look so realistic, that they will trick the eye of any visitor to your home.